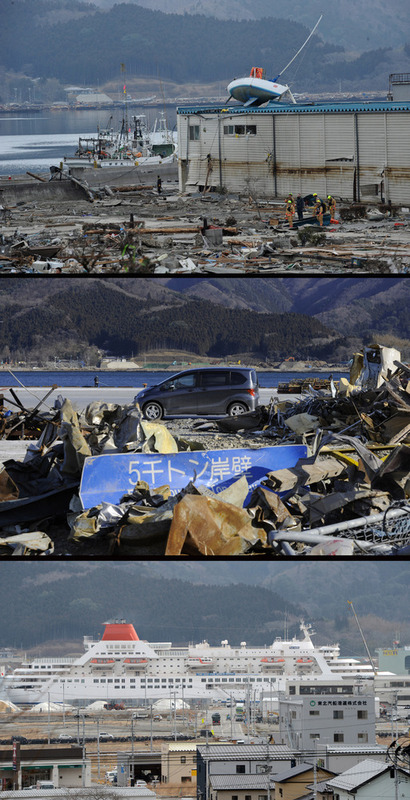 The piles of rubble left behind by the receding tsunami have largely gone, but two years after nature visited its fury, some stretches of Japan's battered northeast remain little more than ravaged wastelands. Where once stood mountains of detritus, the splintered remains of wooden homes and shattered lives, occasional new buildings have crept up and some houses have been repaired. Gleaming signs direct traffic along freshly laid roads as cars -- many of them new -- take people to villages and towns that have struggled to their feet. The railway tracks that were twisted and torn by the powerful waves of March 11, 2011 have been re-laid and service has been resumed; maybe fewer people travel on the trains nowadays, but populations are smaller in any case, shrunk by tragedy and the need to move away. Some jobs have returned; new fishing boats bob in bays and the local economy is showing signs of growth, spurred on by government cash that came in fits and starts. The impromptu monuments the tsunami built -- ships dumped incongruously on three-storey buildings -- are largely gone, consigned now to photographs. But memories of the huge waves that swept away whole villages refuse to fade; children still have nightmares, families still mourn their lost, and parts of the coast remain stripped of life. In some areas, mostly those on higher ground, local communities are coming back to life, recovering from a disaster that killed nearly 19,000 people and sparked the world's worst nuclear accident in a generation. In Kesennuma, one of the hardest-hit cities, seafood processing factories have been rebuilt, while sushi restaurants and karaoke bars have reopened in prefabricated huts in a makeshift shopping mall. In Ishinomaki, wholesalers bellow out prices at a re-opened fish market where local fishermen land catches netted by their newly-purchased boats. Up the coast in Otsuchi, however, piles of debris were still visible and the skeletons of buildings dotted vacant sites that have become overgrown with weeds. Some communities have already given up the idea of returning to the tsunami zones and opted to move to higher ground to rebuild their towns. But others remain paralysed, unable to agree on how to move forward. Should they rebuild in the same place, with residents getting back their original plots of land? Or should they start again, taking this as a chance to redesign settlements to take account of their greying inhabitants' needs? Fukushima, blighted in the public mind -- if not always in reality -- by the nuclear disaster that struck a relatively small part of it, has some of the slowest recovering areas. The 9.0-magnitude earthquake generated a giant tsunami that knocked out cooling systems at the Fukushima Daiichi nuclear plant, causing meltdowns that spread radiation over a large area. The government ordered hundreds of thousands of people to evacuate from a no-go zone surrounding the crippled plant, freezing the surrounding towns at a moment in time, the overgrown verges and occasional wandering dog the only sign of desertion. While some people have moved back to communities near the plant, many more now live in other parts of Japan. There are fears it could be decades before some areas are livable again. AFP photographer Toshifumi Kitamura, who retraced the steps he and his fellow journalists took in the days after the disaster said he had been expecting more progress. "I was shocked to see how slow the pace of reconstruction was two years after the tsunami hit the region," he said. "Returning here I remembered the fear that I felt when I was here two years ago. I remember thinking how if I had been here on the day the tsunami struck, I would probably have died."